Over 15 years of research and engineering has gone into the design of the Impulse adjusting instrument. We use a small hand-held adjusting instrument called the Impulse. This instrument offers many advantages for our patients. By its very nature, we can provide an ideal angle and direction to the energy we apply to your spine. 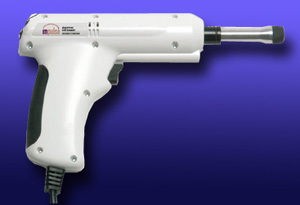 Unlike adjustments performed by hand, this instrument can make your adjustments more accurate. Besides being more precise, patients often remark they find this approach more pleasant. When compared with adjustments delivered by hand, an Impulse adjustment is fast. Very fast! Because the thrust is many times faster than is possible by hand, patients are less inclined to “brace” themselves and tense up. This results in more energy actually reaching the vertebrae, with considerably less force needed. In other words, it works better. When the trigger is pulled and held, the Impulse instrument enters the multiple pulse mode, thrusting 12 times in a row during the course of 2 seconds. It turns out that this frequency (6 Hz) is very special. It resonates with the frequency of your body, creating optimal results. We use the Impulse instrument because of the excellent results it produces and the positive patients comments we receive.